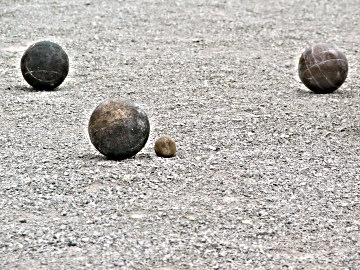 We played bocce a lot last week at the beach. You know, the game where you throw a small ball down a court while teams throw larger balls to see who can get closest to the little ball. The court is long (about 90 ft) and on a breezy beach, you have to throw the ball hard while maintaining accuracy. It’s amazing as we throw the balls, that depending on the perspective of the viewer, it’s hard to tell which is closer. It seems so easy sometimes, but often we have to run down closer to the “action” and see who’s closer. Sometimes we have to stand right over the small ball in order to get the best perspective. When entrepreneurs have great ideas, often they envision what they think will be “closest” to their audience. We know that the closer someone can get a product to a specific audience’s needs, the more successful your company will be. A focus group is a small group (consisting of your potential audience), and a facilitator (who is close to the product, the audience, or your potential marketing campaign), who asks for the group’s perspective. Often it’s easier for someone who isn’t as close to the “idea” to make these decisions. A focus group can clarify a lot. Your audience. You can request various age groups in a focus group to determine what demographic is drawn to your product. Your perceived benefit. When a product is “revealed” to the group, we often hear things that the product can be used for. Most people like to talk about why they would want something. Your features. Sometimes the group helps you develop add-ons or changes to your product. This group that represents your buying group should be listened to. They are truly the closest to the purchase. Their perspective matters (and yours is less important). Your campaign. From everything gleaned from the group, your marketing team will develop your campaign. Or they can have several campaigns to choose from. This group is the “type” of people who will respond to the campaign in the “wild”. The focus group is essential to determining perspective. If you ever wonder “I wonder what they think?”, then you need to find out! You may be tempted to do the focus group yourself; but a seasoned facilitator will be able to achieve more than you will. But doing it yourself is a great first step. Choose the right people, ask the right questions, formulate the right campaign. You’ll be surprised what you’ll learn! The content was really very interesting. Thanks for all your hard work and the info you give.